Cultures Online is a hugely popular free-to-play browser-based MMORPG based on the original Viking mythology. 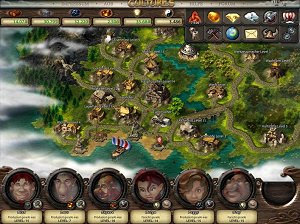 The player selects a hero and starts his or her adventure in a small village, getting the help of more Vikings to help expand the community or explore uncharted territory. Choose the approach to develop your village and tread different paths: are you a warrior, builder or researcher? The hero belongs to a class defined by the type of weapon and his mastery of the weapon is related to his skills. A muscular hero should go for the heavy weapons while the intellectual types will be more deadly with a bow. Cultures Online includes an intuitive battle system to prove your might against other players.